Pininfarina designed the FF's shooting brake-style body. TURIN – Ferrari S.p.A. today released pictures of its first four-wheel-drive model, called FF (Ferrari Four). The supercar will replace Ferrari's 612 Scaglietti flagship and will debut at the Geneva auto show in March. 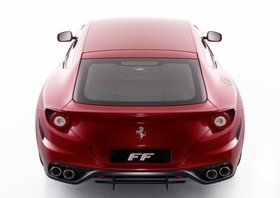 The FF will be a crucial model for Ferrari because the company faces increasing competition from high-performance four-seat coupes such as the Bentley Continental GT/GTC and Aston Martin Rapide, as well as sporty coupes from Porsche, Audi, BMW and Mercedes-Benz. 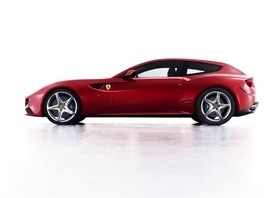 Ferrari calls the FF a revolutionary model that offers “exceptional performance and versatility.” Like the 612 Scaglietti, it has four seats, but it will be powered by a new 660-hp, 6.3-liter V-12 direct-injection engine. Despite having more horsepower than the 540-hp 5.75-liter Scaglietti, the FF will be more fuel efficient with CO2 emissions of 360 grams per kilometer, compared with the Scaglietti's CO2 emissions of 470g/km. The FF has a 335kph top speed and accelerates from 0 to 100kph in just 3.7 seconds. The FF has a station wagon-style tailgate. Pininfarina S.p.A. designed a shooting brake-style body for the FF, which has a station wagon-shaped tailgate that gives access to an extremely roomy cargo area of 450 liters, rising to 800 liters with the rear seats folded down. 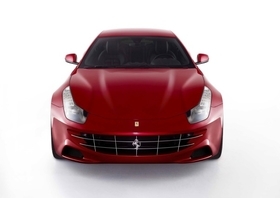 Ferrari chose 4wd for the FF to improve safety and road holding and acceleration with the extra horsepower. With 660hp, the FF matches the output of the 2002 Enzo limited edition model and it will be the most powerful regular production Ferrari. The company built just 349 units of the 665,000-euro Enzo from 2002 to 2004, while annual production of 1,000 units is planned for the FF. The FF is a crucial car for Ferrari. Although it is 4wd, the FF is lighter than the rwd car it replaces. It has a 1,790kg dry weight, 50kg less than the Scaglietti. The FF is 4907mm long, 1953mm wide and1379mm tall. The Scaglietti was launched late 2003 and had an interior face-lift in 2007. Last year, it was Ferrari's No. 4 seller, behind the California, 458 Italia and 599 GTB Fiorano.